Budapest, Hungary - Dohany Utca 22-24. 1St Floor 6. Door Bell:13. 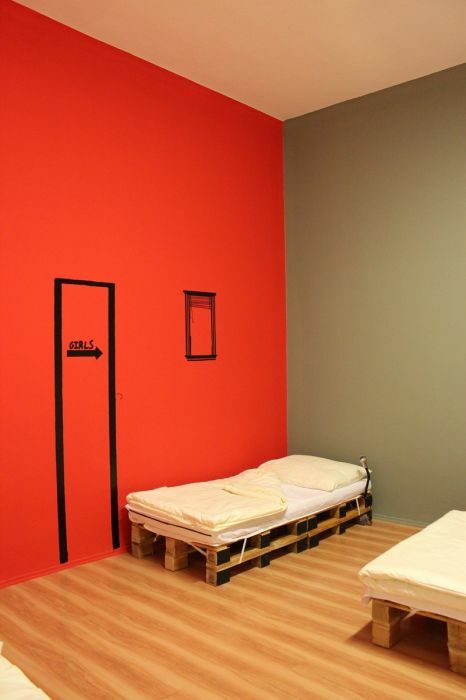 Amazing Brand new hostel in the best location of Budapest. Excellent quality and low prices. Perfect choice to stay! Not bad, not good ... Quite good, but a few thing I didn't like: one of the dormitories is unpeacefull since people need to walk through it do the other dormitory; not-so-cosy neighbourhood so if you're looking for peaceful location, choose some other hostel. LOOKING FOR A PLACE IN BUDAPEST TO CHILL OUT AND HAVE A GREAT EXPERIENCE? AMAZING HOSTEL IS THE RIGHT PLACE FOR YOU. WE ARE PERFECTLY LOCATED IN THE HEART OF BUDAPEST. WE MAKE YOUR STAY UNFORGETTABLE IN A CLEAN AND COMFORTABLE ATMOSPHERE. YOU WILL NEVER WANT TO LEAVE OUR FRIENDLY HOSTEL! OUR PLACE IS ONE OF THE BEST VALUEACCOMODATION IN BUDAPEST. SO COME AND STAY WITH US! AMAZING HOSTEL invites you to discover an exciting new design!!! Hey guys! Looking for a place in Budapest to chill out and have a great experience? Amazing Hostel is the right place for you. We’re travellers like you. What we can promise: we make your stay unforgettable in a clean and comfortable atmosphere. 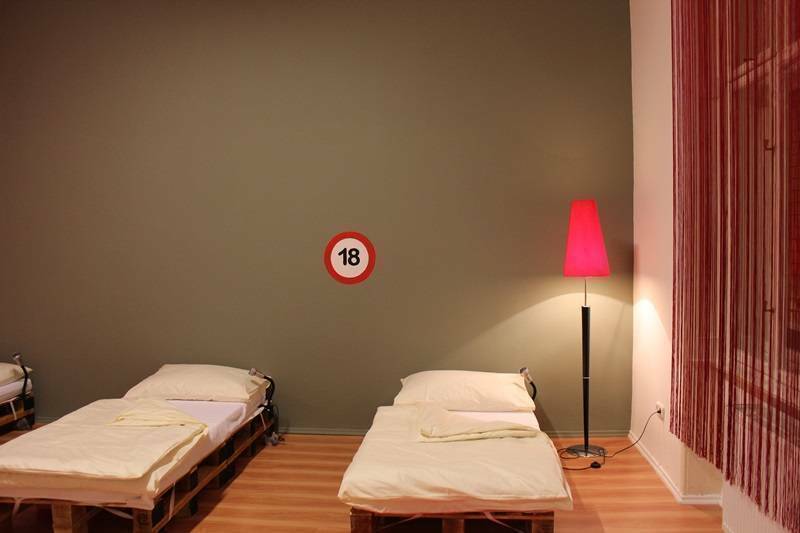 You will never want to leave our friendly hostel! Our place is one of the BEST VALUE accommodation in Budapest. We’re just very close to every activities. We can recommend you things to do, places to eat, different sightseeing programs, parties, restaurants, pubs, cafés, bars, 24-hour shops, clubs and lot more , so there is no need to stay far for whatever you need. Just ask our helpful receptionist. Our MULTILINGUAL(english, italian, russian, german) speaking staff will do all they can to make you feel home! We’re set in a more than 100 year old really unique and original historical building with external and internal ornaments. Was the biggest toy shop in Budapest. Our custom-designed hostel features a lovely lounge area with different elements of Hungary rich culture, providing large sofa and many comfortable seats to chill, listen music, watch films, play PS2 and meet people from all around the world. We have fully equipped kitchen , table to eat or play games. (we have big selection of FREE movies and games as well). Each room at the hostel is unique and has different style with comfortable beds in spacious rooms to make sure our guests comfort during their stay. We provide free lockers to keep your valuables. Free Intenet and Wi-Fi, free use of our Skype headsets, free good quality tea and coffee – ANY TIME! Our friendly staff can provide you with free maps and any tourist info you might need. We have 24-hour check-in . Breakfast is available whenever you wake up! Make sure you order a night before! (Breakfast is not included in room price). FREE BED LINEN - NO SLEEPING-BAG NEEDED! FREE BUDAPEST INFO: WHAT TO DO AND WHERE BARS, CLUBS, PARTIES, RESTAURANTS, SIGHTSEEING PROGRAMS AND A LOT MORE! FREE USE OF GUEST KITCHENS - FULLY EQUIPPED: MICROWAVE, FRIDGE…. ETC…. BOOK NOW FOR THE BEST HOSTELLING EXPERIENCE IN BUDAPEST! PLEASE NOTE: the Hostel is not a party place or place of amusement, the Hostel provides accomodation place for every tourists, so we kindly inform you that the ALCOHOL should be consumed only in MODERATION at the hostel, with the agreement of the hostel manager. No stag parties !!! We only ask you to respect our guests and neighbors in the house, and minimize the noise if returning late. For the composure and quietude of our neighbours we ask you to keep silent in the outdoor area of the hostel (corridor and staircase) after 10pm. Famous pedestrian street: Vaci utca. What is more, there are a lot of entertainment facilities in our neighbourhood. Just ask our helpful receptionist. Our English speaking staff will do all they can to make you feel home at Amazing Hostel Budapest, and help you to find your way around: we recommend things to do, places to eat, different sightseeing programs, bars, clubs, parties, restaurants (we can even make a reservation for you!) and a lot more! Double room: PARIS ROOM: Double private room. Romantic - vintage atmosphere. To secure you will be charged for two people even if it is just for yourself. Also suitable as twin private. Shared bathroom. No window. 4 bed Mixed dorm: BANGKOK ROOM: Dormitory style and range in size from 2 beds upwards. Mixed accommodation. Minimal asian style for the soul. 4 bed separate dorm room. Ideal for groups but single travellers can also book here. Basic 5 bed Mixed dorm: MIAMI ROOM: Dormitory style and range in size from 2 beds upwards. Mixed accommodation. The dorm has a cool designed beach style. The room interconnected with the 5-bed room. 3 bed separate and 1bunk bed room. Ideal for groups but single travelers can also book here. 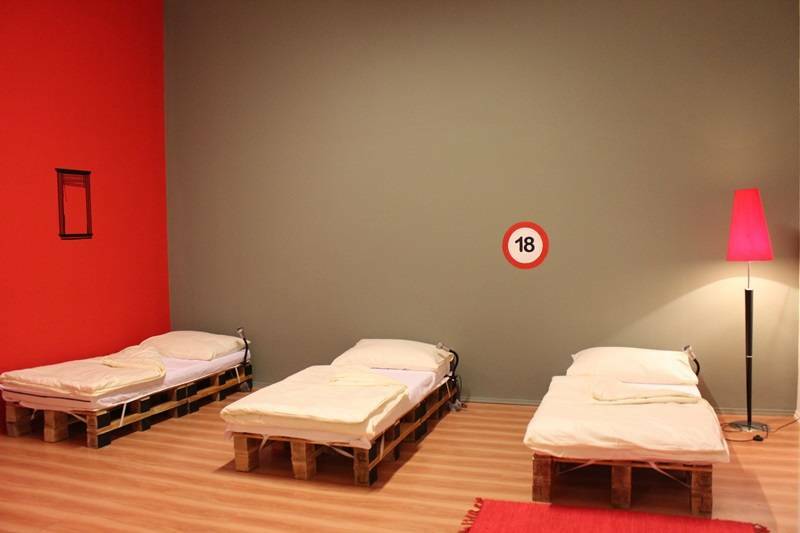 Standard 5 bed Mixed dorm: AMSTERDAM ROOM: Dormitory style and range in size from 2 beds upwards. Mixed accommodation. The dorm has a tempting designed red light style. 3 bed separate and 1 bunk bed dorm room. Ideal for groups but single travelers can also book here. The price is valid for one person per one night. After your arrival, we would ask you to pay cash (Hungarian Forints, Please). If you don't come and don't cancel your reservation prior 72 hours of arrival, only then is it our policy to charge the first night's accommodation from the card. In case of unexpected events please cancel your reservation by fax or e-mail. Naturally we will send a confirmation of the cancellation as well! Dohany Utca 22-24. 1St Floor 6. Door Bell:13. Take the red metro (M2) towards Astoria, then it is only a 2 minutes walk. When you get off the metro, use the right exit, towards Rakoczi ut. Walk along until the first corner (Síp utca), turn left and cross Dohány utca, then turn right and after a few meters the hostel will be on your left-hand side: Dohány utca #22-24. Take the airport bus (Repter Bus Nr 200) which takes you to Kõbánya Kispest metro station, then switch to the blue metro (M3) for 10 stops to Deák tér, there you can walk(5 min.) or get on to the red metro (M2) for 1 stop to Astoria, or you can even use tram #49 for 1 stop. Use red metro (M2) towards Astoria (2 stops). Take the blue metro (M3) towards Deak ter (it is 2 stops), then walk 5 minutes or get on the red metro (M2) for 1 stop to Astoria. Use red metro (M2) TOWARDS ASTORIA (6 STOPS). It is 5 minutes by foot or you can get on the red metro (M2) 1 stop to Astoria, furthermore you can use tram #49 for 1 stop. It is 5 minutes by foot or you can even use bus #7 for 1 stop. It is 5 minutes by foot or you can use tram #49 for 1 stop. It is 5 minutes by foot or you can use bus #7 for 1 stop or the red metro (M2) towards Astoria (1 stop).